A refreshing herbal formulation packed with the power of Fennel and Mint, Himalaya Active Fresh Mouthwash helps prevent mouth odor. Fennel is also a potent astringent that tightens gums. Mint has cooling and analgesic properties which give long-lasting fresh breath. It kills 99.9% of bacteria, providing up to 12 hours of protection from germs. Our mouthwash also prevents plaque build-up and helps maintain cleaner, fresher, and healthier oral hygiene. 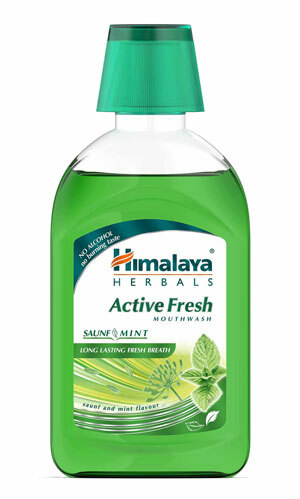 Himalaya Active Fresh Mouthwash contains no alcohol and does not cause a burning sensation post use. It is fluoride free and clinically tested. Fill cap with 15 ml of mouthwash, rinse thoroughly and expel after 30 seconds. Do not swallow. For best results, use after Himalaya Active Fresh Herbal Toothpaste twice daily.